An unwelcome alarm dragged us back into the land of semi-consciousness at 4:15 AM. The alarm can never complete the job by itself but a good old cup of tea soon managed to finish the job properly. We are off to look after a house and cat for a friend and former colleague, Bets Strohl. The house lies between Tomales and Petaluma, about 50 miles north of San Francisco and the Golden Gate Bridge. The taxi turned up promptly at 5:45 AM in yet more depressing rain and we had a pleasantly uneventful and swift trip to Heathrow’s terminal 3 for our American Airlines flight. Bets had really spoiled us and had used her air miles to book us business class seats for our trips. Our first luxury was the dedicated business class check-in line. Carol is somewhat used to this treatment given her history of flying to America on American with EDS but, to a mere mortal such as myself, this was an exciting novelty. Business class entitled us to spend the three hours waiting to depart in the American Airline’s Admiral’s Club Lounge. Here, the day really started with a desperately needed coffee (it was much too early for one at home) washed down with a couple of Bloody Maries. Well, the sun must have been over the yard-arm somewhere in the world. I like American Airlines a lot. Their cattle class seats have the most generous leg-room that I have ever experienced. Their business class seats were, of course, very comfortable and proved to be something of a technical entertainment, supplementing the on-demand video seat back system. 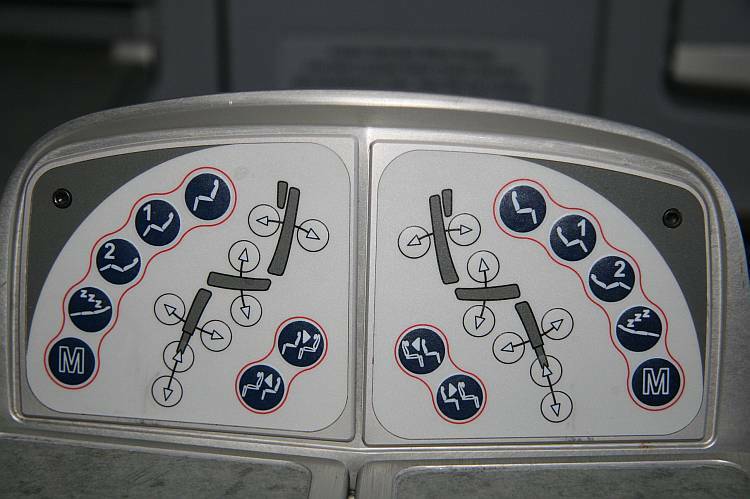 The seat seemed to be infinitely adjustable with four pre-programmed positions but with every aspect of the position then being finely adjustable via separate buttons. Most things were self-explanatory but we couldn’t quite figure out what the “M” button did. Eventually I tried it and was greatly relieved not to end up with a broken back having been power-folded into an M-shaped seating configuration. AA must have known I was coming. What did I find on the video system? The finest movie of all time: Casablanca. Brilliant! Maybe I could just put it on repeat? Apparently not, but with all this entertainment, the eight hours flying time to Chicago was shrinking all the time. We landed on time in Chicago to worse weather than in England; thick dark clouds and heavy rain. We found relatively short immigration lines, collected our bags promptly and were soon using the train shuttle system to change to their terminal 3 for our onward flight to San Francisco. We were supposed to leave in three hours but the departure board was littered with about 40 “delayed” flights, including ours, together with a dozen or so “cancelled” flights. Oh dear! More time in the Admiral’s Club. Our delay kept increasing and eventually went up to two hours. We got a little concerned when a laptop-equipped pair of English guys on the next table turned out to be waiting for our flight and announced that the AA on-line system showed it as having departed. The very time we wanted to be travelling with a laptop, we didn’t have one. I was concerned that Bets would think were on time and spend a fretful time waiting for ever at San Francisco airport. I wandered over and asked the English chaps on the next table if I might borrow a browser window on one of their laptops to send an email. This they happily agreed to. Even better, one of them loaned me an American cell phone so I could place a mobile call to Bets and let her know the situation. What nice guys! Our small world or, maybe more accurately, small industry, was highlighted when mobile-phone-guy turned out to know one of my former companies, Altergo Software, and its founder, Raj Thomas. The four of us were eventually relieved to get airborne after five hours. The cloud was now completely on the deck and, having climbed to its cruising altitude of 30,000 feet, the plane remained buried in said cloud. We eventually broke cover into clearer weather and, after four hours at one straight shot of Jack Daniels per hour, we finally arrived, happy and relaxed, in San Francisco where a relieved Bets met us at 9:00 PM local time, about two hours later than planned. An hour or so driving got us to Tomales and we unwound catching up on some of the last 10 years chatting for an hour or so. After 26 hours travelling, though, we soon hit the sheets. All my previous trips to SF have been on direct flights with British Airways or Virgin. I prefer American’s cabins but you really can’t top a direct flight. Jet lag woke us up at 3:00 AM. Of all the people in all the world, you had to….. bump into someone who knew Raj!